An anime convention in Vancouver Canada. This coming weekend, August 22nd to the 24th, there are a few Sailor Moon related guests appearing at AniRevo, Anime Revolution, a convention in Vancouver. The main actor that fans will be interested in is Megumi Ogata, who supplied the voice of Sailor Uranus in the original Japanese version of Sailor Moon. Viz Media will also be at the convention hosting a number of panels. Stephanie “Sugar” Lyn Beard, the English voice of Rini, was previously announced a guest but will be unable to attend. In addition to playing Sailor Uranus, Haruka Tenou, in Sailor Moon S and SailorStars Megumi Ogata also supplied the voices of Young Mamoru in the Sailor Moon R movie, Petz in the Sailor Moon R season as well as a number of smaller roles and monsters of the week. Charlene Ingram, senior manager of animation marketing, will be representing Viz Media and hosting a number of panels. On Saturday Viz will be hosting two panels. The Viz Media panel takes place Saturday at 5pm and the Viz Animation panel will be taking place at 9pm. On Sunday at 1pm there will be a screening of episodes 8 and 10 of Viz’s new Sailor Moon dub. These episodes feature the introductions of Sailor Mercury and Sailor Mars. Fans will be able to hear Kate Higgins as Sailor Mercury and Cristina Vee as Sailor Mars. Legendary anime voice actor Kappei Yamaguchi will be a guest of honor at Anime Revolution in Vancouver August 16th to the 18th. 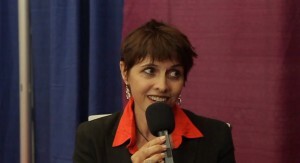 Kappei Yamaguchi provided the voice of Artemis in the live action Pretty Guardian Sailor Moon series. 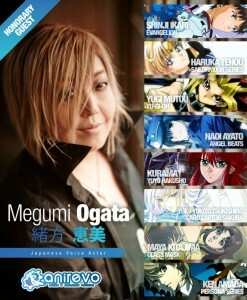 He has also provided voices for many iconic anime characters such as Inuyasha and Ranma. 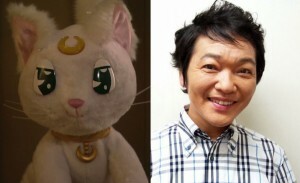 Kappei Yamaguchi joins Sailor Moon voice actor Toru Furuya, Tuxedo Mask from the anime series, who was previously announced as a guest. Source: Anime Revolution via Moon Chase! Toru Furuya, the original Japanese voice of Tuxedo Mask from the Sailor Moon anime, will be making an appearance at the Anime Revolution anime convention in Vancouver August 16th to the 18th 2013. 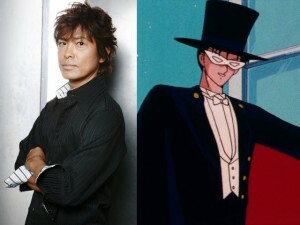 Toru Furuya not only provided the voice of Tuxedo Mask as well as many other anime characters but he is also slated to reprise his role in the new Sailor Moon anime which was originally scheduled to be released this summer. He will be the guest of honour at the Anime Revolution convention, which last year played host to a number of Sailor Moon voice actors from the English dub in their celebration of the 20th Anniversary. Anime Revolution has got yet another interview posted as part of their 20th anniversary celebration from their convention in Vancouver earlier this year. This interview is with Terri Hawkes, the voice of Sailor Moon. Terri Hawkes discusses her role with the show, what it meant to her and what she thinks it means to other and the industry as a whole. You can catch Terri Hawkes in person at G-Anime in Gatineau, Quebec, this coming January. Here’s an interview with Stephanie “Sugar” Lyn Beard, the voice of Rini aka Sailor Mini Moon from Anime Revolution 2012 in Vancouver. Sugar talks about her early days on the radio, working on the zone and her work on Sailor Moon. She also plugs her new movie “For a Good Time, Call…” which is now playing in select theatres. 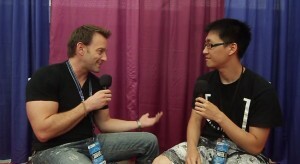 You can watch the interview at the Anime Revolution site. It’s also embedded below for your convenience. The Anime Revolution web site has posted a couple more great interviews from their convention where they had six Sailor Moon voice actors present to celebrate the show’s 20th anniversary. First is an interview with Susan Roman, the voice of Sailor Jupiter and the second is an interview with Vince Corazza who played Alan Granger and eventually Tuxedo Mask in the later two season. Vince gives a nice explanation of the rythmo-band technique which was used to dub Sailor Moon which made the lip synching match up perfectly to the video. You can watch the interviews on the Anime Revolution web site. We’ve also embedded them below for your convenience. Last month at Anime Revolution in Vancouver there were a number of Sailor Moon voice actors in appearance. The Anime Revolution web site has posted a couple of interviews with some cast members. Last week they shared an interview with Katie Griffin, the voice of Sailor Mars, and this week they’ve posted an interview with Ron Rubin, the voice of Artemis. In both interviews the voice actors talk about their work on Sailor Moon. The videos of the interviews are included below. Last month at Anime Revolution in Vancouver there was a 20th Anniversary celebration including a panel featuring six of the cast members from the English dub. From left to right this panel includes Vince Corazza, voice of Tuxedo Mask, Stephanie “Sugar” Beard, voice of Rini, Ron Rubin, voice of Artemis, Terri Hawkes, voice of Sailor Moon, Susan Roman, voice of Sailor Jupiter and Katie Griffin, voice of Sailor Mars. The video is split into two parts. The quality isn’t perfect but the sound does come through pretty well so it’s well worth a listen. Part 1 and Part 2 cover the entire panel. The third clip included below covered a half hour in the middle and is of higher quality. The voice actor portion begins 37 minutes into the first clip as it’s preceeded by some Karaoke and clips of many incarnations of Sailor Moon. This past weekend at Anime Revolution in Vancouver there were six Sailor Moon voice actors in attendance. 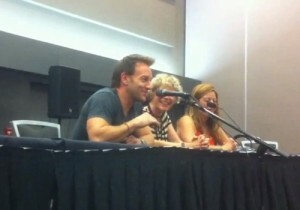 A fan recorded this panel which featured Katie Griffin, the voice of Sailor Mars, Susan Roman, the voice of Sailor Jupiter and Vincent Corazza, the voice of Tuxedo Mask. The sound isn’t excellent because of interference from another panel next door but regardless the content of the panel is something fans will find quite interesting. Anime Revolution is coming up August 17th to the 19th and as part of a Sailor Moon 20th anniversary event they got a great line up of voice actors from the Sailor Moon dub! There will be Terri Hawkes (Sailor Moon), Vince Corazza (Tuxedo Mask), Katie Griffin (Sailor Mars), Susan Roman (Sailor Jupiter), Stephanie Beard (Rini) and Ron Rubin (Artemis). Sailormoon 20th Anniversary Panel – Celebrate everything that is the wonderful world of Sailor Moon in this very special panel, featuring voice actors from the english dub, song numbers, including a special performance by Irulanne, visuals and all sorts of other fun stuff! This is quite an amazing group of voice actors they’ve managed to score! While Sailor Moon roles changed a number of times, as the series went on for so long, these are largely the actors who are most memorable for the roles they did.